Emory 21 Days of Peace offers training, service and discussions on building peace at home and abroad, aiming to inspire, educate and empower students with tangible skills. 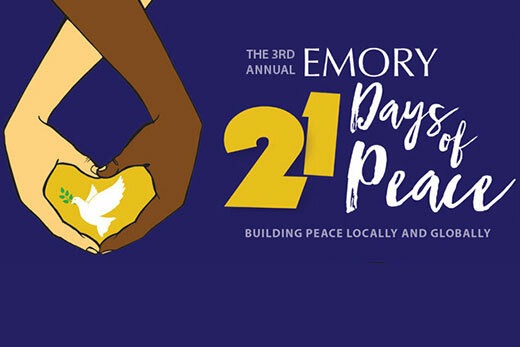 The third annual Emory 21 Days of Peace kicks off this week, offering a series of advocacy training sessions, a town hall and a film screening. The events are open to the Emory community, though principally aimed at students. “The word peace has ties to the Hebrew word shalom and the Arabic salaam. These words remind me that we participate in a global community. They call us to seek justice, health and dignity for all our neighbors and for future generations,” notes Emory President Claire E. Sterk. “I encourage us to listen to each other’s stories, to allow ourselves to be changed by those whose experiences differ from our own, and to lead with compassion always,” she says. The series begins Sept. 8 with the Welcoming Day of Service, organized by Volunteer Emory, taking students off-campus to work with a variety of service organizations including food banks, animal shelters, daycare centers and more. Then, Sept. 12 is the 37th Annual Carter Town Hall with former President Jimmy Carter, to be held in the Woodruff Physical Education Center gym at 8 p.m. Though free, the town hall is a ticketed event. Very limited tickets are available at the Alumni Memorial University Center information desk, located on the first floor in room 114, with an EmoryCard. Several workshops are planned throughout the 21 Days of Peace. Another workshop, Organizing for Social Change, will be held on Saturday, Sept. 15, from 10 a.m. to 5 p.m. in Brooks Commons at Cannon Chapel. This day-long training on organizing for social change is in partnership with Midwest Academy, a national training institute committed to advancing the struggle for social, economic and racial justice, enabling ordinary people to actively participate in the democratic process. Open to Emory students, the training provides concrete skills as well as a framework for thinking about how to do effective progressive organizing. This training is free and lunch is provided. Applications are due by Sept. 9 and attendees must commit to the full day of training. how to think bigger about knowledge to have more impact. A screening of the film “Merci Congo” and conversation with Neema Namadamu will take place on Wednesday, Sept. 19, at 6:30 p.m. at the Jimmy Carter Presidential Library and Museum. A shuttle service is provided from/to Emory University and the event venue. The independently produced 90-minute documentary that exposes the humanitarian impact of mining in East Congo. In the film, activists tell their stories of supporting victims of sexual violence; demanding clean water for a city; empowering women in remote areas with technology; and cutting funds to rebels by changing a business model. A conversation between Namadamu, founder of Maman Shujaa or “Hero Women” in Swahili, one of the activists featured in the film, and Erin Crysler, associate director of the Carter Center Democracy Program, will follow the screening. The final event is a conversation between Namadamu and Emory student peace builders about building peace in local and global communities. This lunch event will be Friday, Sept. 21, from noon to 2 p.m. in Room 102 of the Center for Ethics. Emory’s 21 Days of Peace is a collaboration between Emory’s Institute for Developing Nations at Emory, Emory Campus Life, The Carter Center’s Human Rights Program, and The United States Institute for Peace in connection with the United Nations’ International Day of Peace, which is Sept. 21. For more information, visit the Institute of Developing Nations’ website.